I love my short fringed boots and I get a lot of compliments on them. They're very comfortable as well. 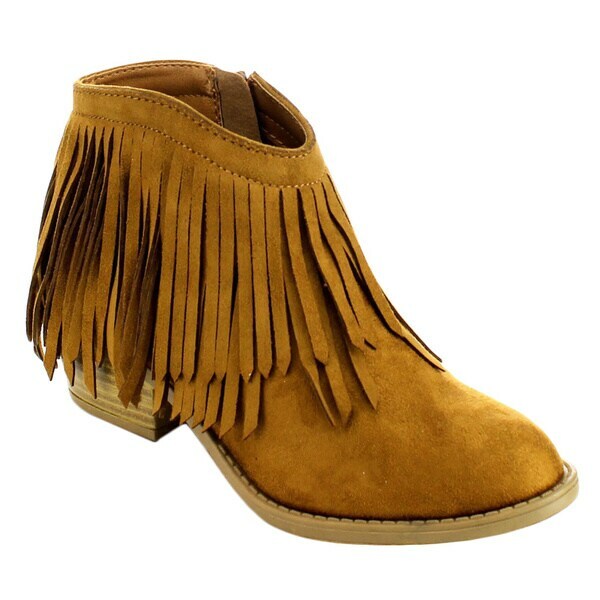 It is featuring a clean round toe, fringe trim falling from shaft, stitching detail on the top, side zip closure for easy wear, and soft faux suede body, cushioned insole, mid stacked heel. True to size and very comfy! My wife absolutely loves these shoes. No problems with fit or quality. They are so pretty. They wear so good. I wore them all day long at work and they did not hurt my feet at all. Really love these!!! I like the boots, but I can't get them on with my bad toe. "Really like this style but need extra wide width"
Hello carolyne m., unfortunately, this boot is not offered in a wide width within our inventory. We apologize for any inconvenience. Thanks for shopping with us! BECAUSE I love fringe and I love boots. I wanted booties with fringe.